Thank you nature, there’s a chill in the air. Sweaty season is over. I’m putting on a light jacket in the morning and that means ice season is on its way. What kind of gear should you let dry by a fire after a great day of ice climbing? I asked the Fox Mountain Guides and below is a summary of answers to some questions from a client joining us for the upcoming New Hampshire ice trip. Nada is the most common answer. Leashes are handcuffs. I admit to dropping a tool near my belaying son last year though and plan to get tethers for multi-pitch terrain where a tool loss would be a major problem. Hammers on both tools. Less fear of severe face lacerations. A hammer to hammer pick setting can be good for the nerves when things get scary on lead. The answers from guides who visit alpine terrain remind us that an adze can be handy for carving out steps,bollards and platforms. Mono point or dual point? Dual. Mono points are well liked for the most technical ice but two point crampons were the most frequent answer. Some serious efficiency was mentioned however by using mono points to select already prepared pick holes instead of another tiring kick. Leather boots provide the right combo of warmth and comfort for most settings. Unless your goal is extreme conditions at extreme altitudes leather boots offer enough warmth and better performance. Pants. As much as I hate biting wind on the small of my back the feeling of bibs never appealed to me at all. They always seem to ride north when I reach. Go with good soft shell pants unless the weather gets nasty then have your hard shell. The Patagonia guide pants have a wonderful feel. Tuck in a long shirt. Gloves:Thin and manageable or thick and warm? The consensus is just in the middle. Lined leather work gloves from Marmot smeared in mink oil are durable and grippy. A couple pair of fleece gloves inside the jacket to switch in and out for warmth at the belay. Oversized boots with extra socks? No. Let the quality of the boot provide the warmth. Get them well fitting with your regular high quality medium weight hiking sock. You will walk a while in these after some multi pitch adventures so comfort is important. Who makes the best boots? 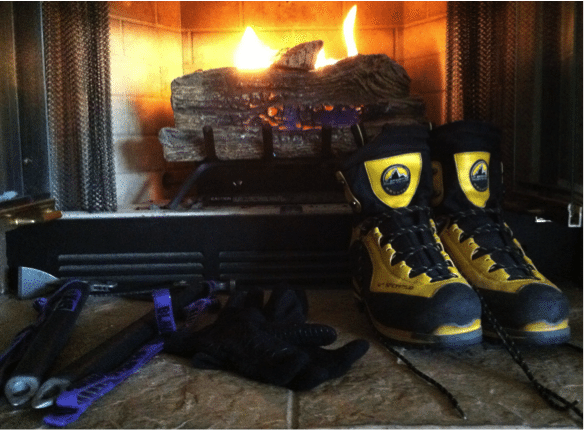 La Sportiva boots are super awesome and were the unanimous choice of the Fox Mountain Guides. I bought otherwise a few years ago because of a killer price and bent the lace hooks during tightening. Look at the Nepal EVO GTX. You can tell they were made with love. Hope you enjoyed the answers. The first person to send me an email correctly stating which tiny piece of imperative Ice climbing equipment I’m thinking of will receive one by mail. I hope to see you in New Hampshire where ice screws sink all the way down!